From the Firth of Forth I went through the Caledonian Canal and round Ireland anti-clockwise, which many people consider to be the ’wrong way round’. Most, but by no means all of the journey, was sailed solo. On the way I skirted a lot of the bits of what is sometimes called the ‘Celtic Fringe’. If you are used to travelling in Britain by road and rail it’s easy to think of the Gaelic bits as being on the ‘fringe’ - beyond the main lines of communication. But by sea it’s very different. Cruising at four or five knots you can appreciate this ‘fringe’ from the point of view of the people who lived around and travelled across these waters in the past. From this perspective the Celtic lands are at the centre of a watery motorway network. The land of the Angles, to the east and south, is an uninviting ‘fringe’ of flat, featureless swamp and undergrowth. This is not, as I’m sure is apparent, the gripping story of one man’s struggle for survival on a cruel and savage ocean. Neither does it aim to be a pilot book or a set of sailing directions. It’s just the story of a wimp’s summer holiday. I like to think that sailing solo hones the senses and heightens critical awareness. Others have agreed that yes, it does make me moan a lot about things. The world is a fantastically annoying place and I haven’t tried to resist the temptation to rant about it. Many people have remarked that this account ought to be used for kindling. Taking their kind words to heart a version of the tale is now available on Amazon for the Kindle. Click on the cover image below to go to that bit of amazon.co.uk. 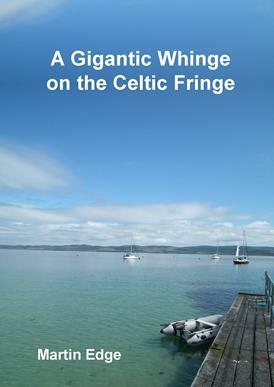 If you are struggling with the grainy black and white photos on Kindle, all the images in ‘A Gigantic Whinge on the Celtic Fringe’ are available on PDF here.